Melton Mowbrary, in the Southern Midlands, where the road to Bothwell joins the main highway. Originally known as Crossmarsh. That is the area was known at Crossmarsh. Then the guy who built the hotel (in the 1850s) named it (or his property) after his birthplace in the UK and that name was picked up for the area. The metal silhouettes entertain travellers along the Midlands Hwy (between Tunbridge & Kempton) but even if you're deliberately looking for them, it is hard to see more than a handful each trip. Some of them are easier to see from one direction than the other. On this trip from Hobart to Launceston we found fourteen of them (and missed two). Boarding the stage coach (and patting the horses): southern entrance to Kempton. Pontville, on the Midlands Highway, just north of Brighton. The most noticeable features being the bridge and the hotel. A little collection of photos I like to call "Photos taken from a car travelling along the Midlands Hwy while the sun was setting" because, well they are, except for two. :) I took them because the light was interesting. Other than this first one, they're presented in the order they were taken, from 6.50 pm to 7.50 pm. 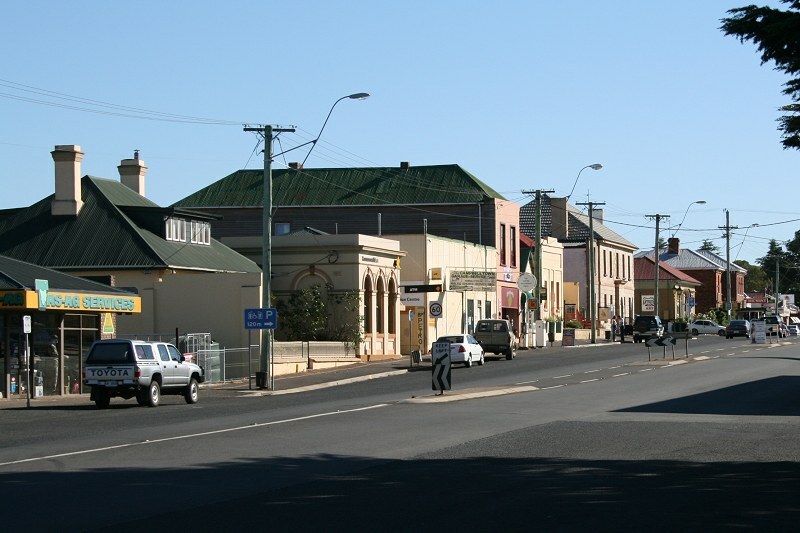 Campbell Town is on the Midlands Hwy. 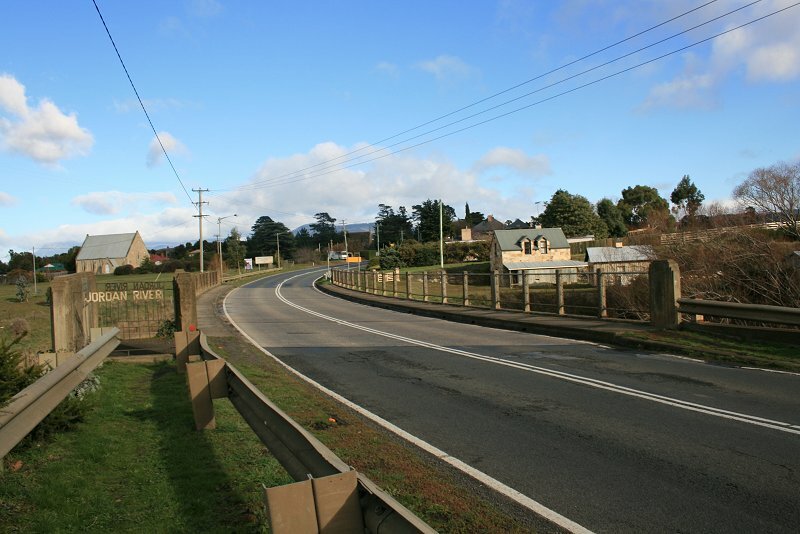 "Campbell Town is a major pastoral and tourist centre in the Northern Midlands, originally established in 1821 by Governor Macquarie as one of the four garrison town and probation stations between Hobart and Launceston. "Campbell Town, and the Elizabeth River, which runs through it (previously known as Relief Creek), was named by Macquarie after his wife, Elizabeth Campbell." 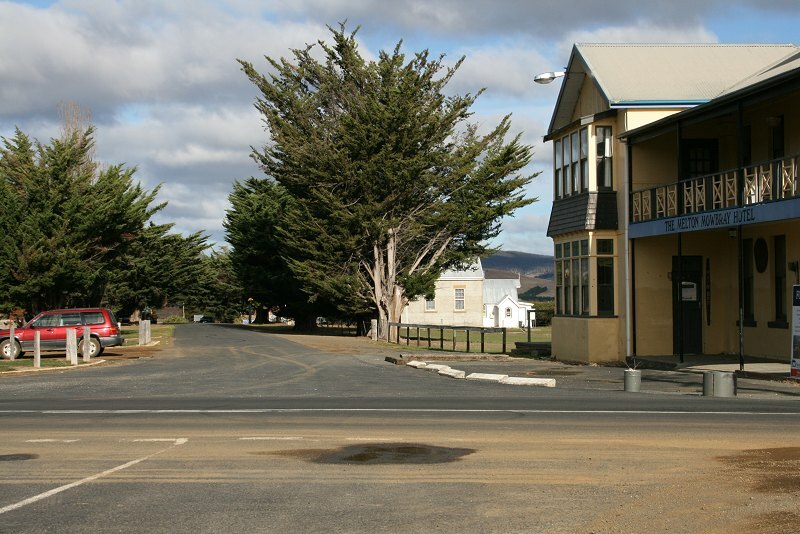 If you're heading south, it's the last town on the actual highway until you're almost in Hobart. And if you're heading north, it's the first town after a long drive with no towns along the highway. So it's a popular stopping place. It's about 132 km from Hobart and 41 miles from Launceston. I uploaded some photos from trip to Hobart earlier in the month but they were the wrong ones. But, um, you can still look at them, right? Starting with hotel at Pontville. Crown Inn, 1835, I'm assuming it was a coaching inn originally. This is about the Midlands Highway, that bit of road running from Launceston to Hobart and back again, so I can work out what I have already written about and provide some context for future posts. It has a map, which links to a bigger map. Its not a very fancy map but it's mine. And there are notes on the towns. Saturday, we had to leave for Hobart at sometimethatdoesn'treallyexist am because the gun show opened at 9 am and we needed time beforehand to set up. So some early morning photos. There was a big metal shed that doubled as the Dealer's Hall and Exhibition Hall. Outside was a large dirt arena, where the live displays (enacting?) took place, and a scattering of displays around the outside (the Army and a collection of military vehicles). A small event is probably more social and relaxed than a larger gathering, but it puts extra pressure on those exhibitors that were there. I think both the WW2 group and the Light Horse did 3 displays each of the three days (or 2 on the last day) which was quite demanding, and it's hard being a dealer when it's quiet. (It's also hard being a dealer when you have more customers can you can deal with at once, but that's the sort of hard one can live with.) It has the potential to grow though, especially now that there is material available (photos!) to promote the next one in 2010. It can play games with your head though. On the Saturday morning, I came out of the pavilion while everyone was setting up, and saw two medievalish characters walking past some Word War II soldiers. I'm used to one twist on reality -- whether it's an old house or a replica ship or people in period costume against a modern backdrop -- but multiple twists can be jolting at first. 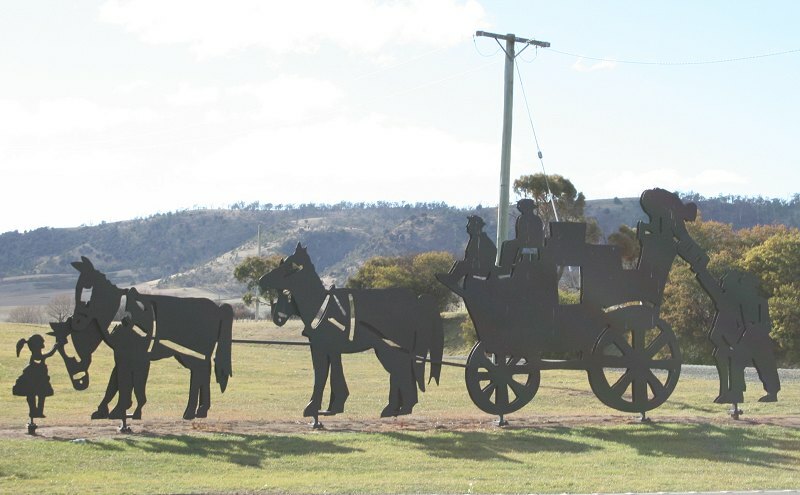 If you go down the Midlands Highway, the main road between Launceston and Hobart, you'll probably notice a number of bronze silhouettes along the road of the road. There's about half a dozen on them, and you never seem to be able to see all of them on any trip. Difficult to catch on camera in a moving vehicle too. This year, more were added and, even better, I've managed to get some photos of them already!